Shades are made with your choice of fabric from the Romanzia Fabric Collection – including the entire line of Phifer Sheerweave sunscreening, translucent, and blackout fabrics. 12 Volt DC Battery Motors with Internal rechargeable batteries. 12 Volt DC Battery Motors. 24 Volt DC Wired Motors. Young children can STRANGLE in cord and bead chain loops. They can also wrap cords and bead chains around their necks and STRANGLE. Always keep cords and bead chain loops out of children's reach. Move cribs, playpens, and other furniture away from cords and bead chains. Children can climb furniture to get to cords and bead chain loops..
Do not remove lift cords from lift cord shrouds. Attach bead chain loop tension devise to window casing, wall or floor. This can prevent children from pulling cords and bead chains around their necks. Fasteners provided with the tension devise may not be appropriate for all mounting surfaces. Use appropriate anchors for the mounting surface conditions. Please be aware that bead chain control loops present a strangulation hazard, particularly to young children. To address this important issue, the window covering industry has adapted the American National Standard for Safety of Corded Window Covering Products. The latest version of that Standard, ANSI/WCMA A100.1-2014, is now in effect. Romanzia has always taken product safety seriously and we have always done our best to meet or exceed all Industry Safety Standards including product testing, product labeling and tagging, product education, and the use of accessories like bead chain tension devises that are compliant to the Standard. The lift cords on the back of Romanzia's Roman Shades (the styles that use lift cords) are fitted with safety shrouds between the pleats to prevent hazardous cord loops from forming. Each Roman Shade design has been tested using the Hazardous Loop Testing Procedure, Assembly, and Probe described in Appendix D of the American National Standard for Safety of Corded Window Covering Products (ANSI/WCMA A100.1-2012). The test results show that no hazardous loop can form from the shrouded cords on the back of the Roman Shades described in Romanzia's 2013 Catalog and Price List. All Romanzia products that are made to be operated with a bead chain control loop are packaged with a tension devise that is compliant with the latest American National Standard for Safety of Corded Window Covering Products. Before any product with a bead chain control loop is shipped, a tension devise is attached to the bead chain in such a way that "unless properly installed or altered from the shipped condition with a sequential process or tools, it prevents the window covering from operating". When the product is installed, the tension devise MUST be properly installed in order to mitigate the strangulation hazard. 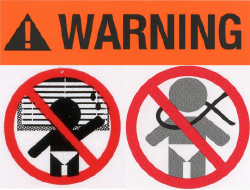 If the product is installed by a window covering professional or anyone other than the end user, all warning tags and product warning labels MUST remain on the product for the end-user to read and understand. For complete safety, parents and caregivers should consider cordless window coverings alternatives like our Spring Roller Shades, Romatech Cordless Shades, Motorized Shades, or Panel Track Shades.